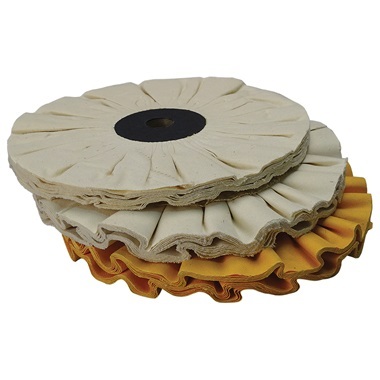 Set includes one of each wheel: 1/2" wide compressed, 1" wide white ventilated, and 1" wide yellow ventilated. Made in USA. Compressed wheel works faster than standard spiral sewn wheels. Also holds more compound and lasts longer. For medium cutting and coloring. Ventilated buffing wheels keep your parts cooler by expanding when wheel is turning. Corrugated face holds more compound than conventional buffing wheels. Resin board center makes installation easy on all our buffers. No special flanges or spacers to buy. White Ventilated buffing wheels are designed for medium cutting and final polishing; Yellow Ventilated Wheels are for medium to coarse cutting action. 8" wheel diameter. Fits 3/4" arbor hole. For 3/4 HP buffer. 1/2" and 1" thick. Made in USA. 10" wheel diameter. Fits 7/8" arbor hole. For 1-1/2 HP buffer. 1/2" and 1" thick. Made in USA.